Scroll down to see our selection of MRI wheelchairs and accessories for sale. MRI wheelchairs and accessories are used to transport patients in and out of an MRI environment safely. We carry a large selection of MRI wheelchairs and accessories for sale including MRI compatible shower wheelchairs, MRI safe standard wheelchairs and MRI wheelchair accessories, such as tank holders, IV attachments and anti-theft bars. What are MRI wheelchairs and accessories? MRI wheelchairs are transport devices designed to be non-magnetic and withstand a high magnetic environment. MRI wheelchair accessories are non-magnetic attachments that improve the use of a MRI wheelchair. 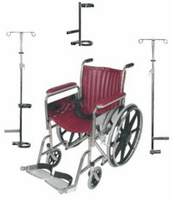 These MRI wheelchair accessories can consist of oxygen tank holders, IV pole attachments, replacement leg rests, heel loop attachments, anti-tippers and anti-theft bars. Some MRI wheelchairs are designed to double as self propelled shower chairs, omitting the need to transfer the patient from one chair to the next.